Business description - A and M Jumbo Bags is engaged in manufacturing and supply of High Density Polyethylene (HDPE)/Polypropylene (PP) Jumbo Bags, Flexible Intermediate Bulk Container (FIBC). The manufacturing unit of the company as well as its registered office is situated at Block 100, Bhagwati Rice Mill, Opp. H.P. Petrol Pump, Jetalpur, Ahmedabad. The manufacturing facility is well equipped with required facilities including machinery, other handling equipment to facilitate smooth manufacturing process. The company offers solutions for various technical issues which the customers face in using FIBCs. It also helps and designs customized FIBCs, by offering complete range of FIBC for packaging all possible products including, food products, chemicals, liquids, etc. 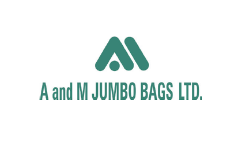 A and M Jumbo Bags IPO allotment status is now available on Bigshare Services' website. Click on this link to get allotment status.